If you are a genuine animal lover, you don’t have to limit yourself to loving only one or two different types of pets. There are animals that also deserve to be loved just as much such as rats. Although rats as pets may sound eccentric to some, know that these tiny creatures are fun to be around provided that you are properly taking care of them. Rats are social, smart, and full of quirks! Domesticated rats are far from being the vermin that most people think they are. Taming rats is an easy and enjoyable task. Therefore, they can be incredible pets, especially for those who are busy as a beaver. They also have their own idiosyncrasies just like dogs and cats. Although taking care of domesticated rats sounds much easier than taking care of larger animals, that doesn’t imply that they are low-maintenance. Rats need your tender loving care and attention. Regardless of how busy you are, you need to devote a fair amount of time to play with your tiny critter; an hour each day would be ideal. But before you adopt a rat, you need to make sure that there is a secure and comfortable rat habitat waiting for him. Buying your rat a good quality cage is the first step to them achieving a healthy and happy life. Since there are too many to choose from, we made a list of the leading rat cages in the market today. To make it even easier for you, we also provided a buying guide so you will know what you are looking for. The Critter Nation 162 by MidWest could be the perfect abode for your tiny whiskery friend. Here’s why: they calibrated their Ferret Nation cage for the best interest of your tiniest pets be it a rat, a pygmy shrew, a chinchilla, a sugar glider, or a hedgehog. You can opt for either a single, double or a three-story unit depending on the number of pets you own. Consumers who have gotten their hands on the double unit love how it provided the ample space their pets need to run around comfortably plus an array of features for the benefit of both the pets as well as their owners. 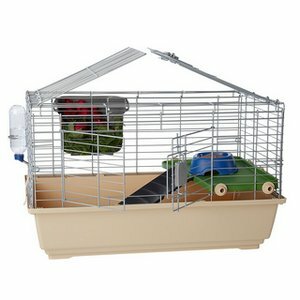 The Critter Nation 162 measures 36” in length and 24” in width and hence, it is very commodious and accommodating: you can place a hammock, some decorations, toys, and other paraphernalia to keep your pet rat happily busy. This rat cage stands roughly 5”2. Regardless, you can easily tailor the rat cage to your preferred height. Its full-width shelves are also adjustable so you can fix it according to your pet’s preferences. Additionally, you can find sturdy non-skid ramps for your whiskery pet to climb up and down. A storage area is also available at the very bottom to keep your pet essentials such as kibble, extra sheets, etc. Moreover, the 162 model exhibits narrow spaces between its wire bars to ensure that your tiny escape artist won’t be able to play hooky out of the 0.5” space. Rest assured that even baby rats or kittens won’t be able to escape, which is critical if you have other pets that may prey on them. The wire bars of the 162 model are durable, thick, stain resistant, and chew-proof. As for your convenience, Critter Nation installed full-width double doors, so it is easy for you to clean and maintain. Like any other Critter Nation product, the 162 model features a unique set of latches that allows you to open the doors in a jiffy or lock it without a hitch. Installing this rat cage is also child’s play. A rubber mallet and just a few minutes of your time are all you need! Although originally designed for ferrets, rat owners can also make most of the delightful features that the Prevue Hendryx Feisty Ferret Cage can offer. Its commodious compartment is inarguably the icing on the cake. Know that rats, which are originally forest creatures, need constant physical and mental stimulation to remain bright and healthy. Therefore, it would be beneficial for your pet rat to have a large area that can accommodate all his playthings and still have enough room left where he can hop and chase with his roommate. As a bonus, the Prevue Hendryx comes with a nice, well-built hammock, so you don’t have to buy it separately. Moreover, this unit is complete with one plastic tray, two metal grilles, two industrial-grade plastic platforms, three sturdy plastic ramps, all of which you can easily remove for cleaning. At the bottom of the cage is a storage compartment where you can place all your pet essentials. In addition, the Prevue Hendryx features two huge escape-proof doors with rust-resistant and stainless steel locks. This allows more accessibility from the either top or bottom, so doing some upkeep is a breeze. Likewise, this feature also allows better interaction with your pet. Every inch of this cage is made of powder-coated stainless steel. You can expect this wrought iron cage to resist wear and tear even after several years of usage. 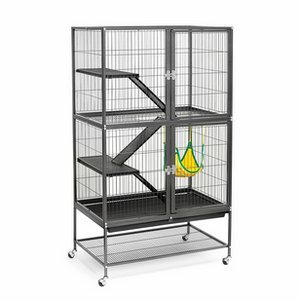 With casters, you can easily transport your cage from one room to another when need be. It is important to note that the Prevue Hendryx Feisty Ferret Cage is originally meant for ferrets; hence, this cage is perfect for large rats too. Smaller or baby rats may find the space bars too large and may squeeze themselves out. The Ferret Nation 182 by MidWest would be the perfect rat condominium if you need to house three or more of your whiskery friends. 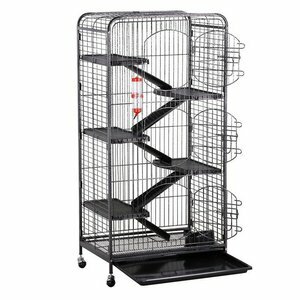 Giant rat cages such as the 182 model can provide an excellent living environment where a bunch of pet rats can happily roam, play, and socialize. If you need to separate the bucks from the does, for instance, you may simply block the middle part of this rat cage to create two separate compartments. Each compartment will still have ample room for toys and accessories. Likewise, being able to do so makes the cleaning process a lot simpler since you can group them all in a single compartment while you clean the other. The 182 model measures 32” L x 25” W x 62.5” H. Considering its size, putting up this rat cage may take a little while but it requires no bolts, nuts, or screws. Simply slide the pegs into the slots with your bare hands and apply a little force using a rubber mallet to lock the panels securely in place. With locking casters, you can be confident that your rat cage stays safe and stationary. Regardless of how easy it is to configure, the Ferret Nation 182 model is built to last a lifetime. Moreover, this rat habitat includes two durable full-width plastic floor pans to provide solid flooring and to maximize play area. This feature also helps prevent deadly accidents due to a heavy fall. Additionally, it comes with two height-adjustable and easy-to-clean shelves; three perfectly angled ramps, which you can easily swing up when cleaning or feeding; plus three non-skid ramp covers to ensure your pets won’t slip while they are climbing their way up or down. With two large doors and removable shelves, cleaning and feeding are made simpler. Whether you are in a budget crunch or particularly green at buying rat cages, the Prevue Hendryx Earthtone Dusted Rose rat cage offers a decent value for the price you pay. Save from its plastic tray, which is situated at the bottom of the grate, everything in this cage is made of metal. It may not be as heavy-duty as the Critter Nation cages, but this unit is fairly sturdy without being too weighty. Also, this rat cage is refreshingly simple to assemble. 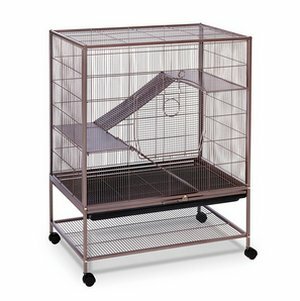 The Prevue Hendryx Earthtone Dusted Rose cage measures 31” L x 20.5” W x 40” H and has a quarter of an inch bar spacing. This rat habitat provides sufficient ground space and three levels for your pet rats to explore. You can make the most of its huge space to isolate a few of your pets such as unneutered bucks or senior rats. The ramps of this model are wide and quite solid with ridges across, which is ideal for weak tiny feet to gain sure footing. Using a non-toxic adhesive, you may use a cloth to cover the ramp if you prefer your pets to walk on a more comfortable surface instead of a cold metal ramp. Unfortunately, its door is somewhat smaller, which makes cleaning a challenge. 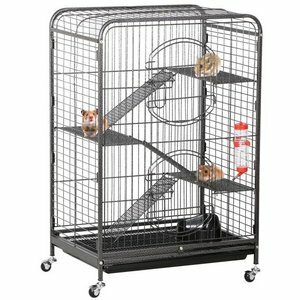 With two full-width double doors, the Critter Nation 161 by MidWest is such a fun cage to own. You can open all four doors and hence, you can easily furnish your rat’s cage with toys and supplies. Most importantly, it makes cleaning a breeze! You can easily take the doors and the shelves out for cleaning. The shelves are made of heavy-duty plastic, which is ideal as it prevents your pet’s tiny feet from foot injuries. You can even find bars under the shelves so you can hang a hammock and other lightweight materials. The Critter Nation 161 is quite a huge, solid cage. It stands 5’4” tall, and measures 36” L x 23” W. Since the Critter Nation is sturdily built, it is quite understandable why it has to be somewhat heavy. Nonetheless, there are casters to make it easy to push or pull around when you need to change its location. The casters also exhibit locking features to ensure your cage stays in place. Considering its price, you can expect a high-quality unit that won’t trouble you with rickety and rusty wiring. Plus, its locking mechanism is exemplary; even the smartest rat won’t be able to escape. This cage is safe for baby rats too as it has a bar spacing of half an inch. However, it would be wise to ask for an extra pair of hands when it comes to its configuration. But once it’s fully assembled, your pet rat can enjoy a comfortable abode. Very spacious, the 161 model is perfect for housing 2 of your fancy rats. Not only does the Kaytee My First Home Deluxe look colorful and cute, this cage offers handy features for your tiny whiskery friends. This deluxe home is designed to exhibit a multi-level space with spiral slides so your pets can have an enjoyable time climbing up and down, which is also a simple yet effective way to ensure that they get their daily exercise. With one large door at the top and another smaller one at the bottom, you can choose to interact with your pets in the most convenient way. Moreover, assembling the Kaytee My First Home Deluxe is nothing but child’s play. As soon as you’re done, your pets can have a cozy abode that measures 24” L x 24” W x 41.5” H complete with free items such as three comfort shelves and a dainty hammock to name a few. While the comfort shelves allow your pampered rat to get an eyeful of the room, the hammock will swing his way into a peaceful slumber. However, the best part of this cage isn’t the shelves or the hammock. The icing on the cake is its removable base, which is made of chew-proof and stain-resistant plastic. Beddings and litter stay in the bin, thanks to its intuitive design. Furthermore, the Kaytee My First Home Deluxe uses chew-proof latches and a wire-base locking system for your pets’ safety. There is no way your naughty pets can chew their way out or for predators to chew their way in. The Kaytee My First Home Habitat is a classic favorite, especially for new pet owners. Measuring 30.5” L x 18” W x 30” H, this cage can easily provide a roomy habitat for one rat or two. Also, it has multiple levels for your pets to explore. If you hate shavings scattering all over your floor, then you will love this cage’s base. The base exhibits a deep and open space with high walls to keep debris from catapulting out of the cage, especially when your pets play roughhouse. Take note that the depth of the base also allows your rats to have some privacy. Another good thing about this cage is how narrow the bar gaps are; hence, even baby rats won’t be able to squeeze themselves out. You won’t find grates or barred surfaces either and thus, this greatly reduces the risk of your pet from getting feet injuries. What is more, this cage is a breeze to clean. Save from discarding the bin’s contents, you only need to wipe the cage and its plastic components using a disinfectant and a damp cloth. The Kaytee My First Home Habitat may not be a heavy-duty cage compared to its expensive counterparts, but as long as your pets aren’t much a chewer, then you won’t be having issues with its plastic parts. The AmazonBasics Rat Habitat features an iron wire upper frame to provide full visibility and maximum ventilation. With two entryways, you can choose between the front and top doors. The cage’s best feature is its deep PP plastic base, which provides a retreat for your pet rat all the while keeping shavings and litter in the base, so your desk or floor remains clean and tidy. What is more, this unit has a generous supply of free items including a non-drip water bottle and a tip-proof food dish among others. Measuring 29.9” L x 18.1” W x 18.1” H, the AmazonBasics Rat Habitat is inarguably a small cage. 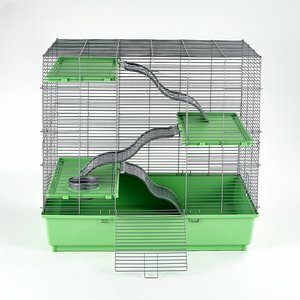 While bigger is always better when it comes to rat cages, there are many reasons why this teensy cage is a must-have. For one, this is cage is the perfect solution when you want your whiskery friend to spend the night in your room. With this cage, you no longer have to worry about your friend while you are on vacation, now that you can bring him along with his temporary shelter. PP plastic base contains shavings, dirt, etc. You can provide a roomy habitat for your pet rats even if your space is limited. 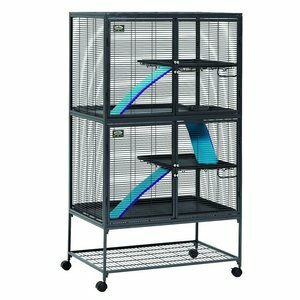 The Yaheetech 37” Metal Ferret Cage, a medium-sized cage measuring 25” L x 17” W x 36.5“ H, is a suitable abode for two large rats. Though originally designed for ferrets, rat owners can also benefit from this cage’s excellent features. One of the best things about this cage is its portability and ease of storage. You have the option whether to fold and hand-carry the cage or push it around using its four heavy-duty casters. Apart from portability, the Yaheetech 37” Metal Ferret Cage provides full visibility and ventilation. This unit is made of high-quality steel with a sleek powder coat finish that makes the cage look and feels expensive, all the while keeping corrosion at bay. Moreover, this unit comes with a 250mL water bottle, a fish bowl, a slide-out tray, three ramps and three shelves so you can set up your pet’s house in a jiffy. Hunting for an affordable all-metal cage seems like a fruitless pursuit, but the Go2Buy Metal Three-Door Cage is proof that not everything of good quality has a bank-breaking price. Be warned that this cage has 1.5” bar spacing and hence, it is only suitable for large, adult rats. If you have a pair of fancy rats, then you’ll have no issue with this cage. There is no stopping you from providing your pets with a multi-story abode complete with a 250mL water bottle, one plastic food container, one removable tray, five shelves, and five ramps. 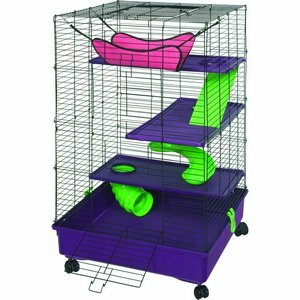 Including its base, this rat cage boasts of six levels for your pets to explore. Each platform is made of durable plastic to ensure that your pets won’t be walking on the wire that might hurt their feet. Since this cage is incredibly spacious, you can spoil your pets by adding as many toys as you want. Assembling the Go2Buy Metal Three-Door Cage is an easy feat and can be easily transported using its four casters. A trip to the vet doesn’t spell fun for rats; hence, you need a portable rat cage that will make his trip as safe and comfortable as possible. 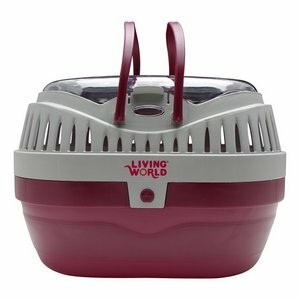 There is no better solution than getting your hands on the Living World Carrier, which exhibits exemplary design features to give your whiskery friend the comfort he deserves. While the top exhibits a practical design intended for improved ventilation, the carrier’s bottom surface has a ridged texture to give your rat a secure footing while traveling. Likewise, this cage has a locking mechanism to ensure your tiny escape artist won’t break free. With two twin handles, carrying this carrier is as easy as carrying a picnic basket. You need to provide your whiskery friend with a habitat that has the conditions necessary to make him feel safe, happy, and comfortable under your roof. The following are the critical factors you need to think about before you make a purchase. According to some rat owner’s blog, at least 2 cubic feet of space is recommended for each rat but we suggest otherwise. Your tiny critter is going to live his entire short life in an enclosure and hence it would be best to make it as comfortable as possible. The short and long of it is choosing the largest cage you can get your hands on as long as it won’t pose an inconvenience to your house. The only way your whiskery friend can enjoy various perks is to have a large cage. While male rats or bucks prefer more ground space, female rats or does prefer more height so they can climb up as often as they want. With a large cage, you can add toys and paraphernalia to keep him entertained. You can place a hammock, a tunnel a digging box, a bean bag, his very own clubhouse, or all of these. Nonetheless, you may opt for a smaller rat cage if you only need to house kittens or baby rats. Bear in mind that you need to transfer them once they grow; otherwise, they won’t have the appropriate space they need to move around and play. It is more economical to choose a rat cage that can accommodate their needs even when they grow into full adults. Take note that rats are originally forest creatures that live in harmoniously large groups. Among all rodents, rats are the most social. Therefore, it would be wise to adopt at least a pair of rats instead of just one. Take a closer look at the cage’s doors. Its doors should be wide enough for you to reach in and take out your pet. If you opt for a full-width door, it’s better. Such a feature prevents you from squeezing yourself into an opening just to interact with your pet. A full-width door also paves the way for quick and easy cleaning. Fish tanks and plastic enclosures are the worst dwellings you can ever bestow on your pet rat as these items easily build up ammonia and air contaminants, which could greatly affect your pet’s respiratory health. Likewise, these dwellings build up humidity and temperature quite fast. Rats are highly susceptible to respiratory illnesses and hence, they need a well-ventilated cage. Glass and plastic enclosures isolate bad air quality and thus, foul smell and contaminants will linger much longer. Although some plastic cages may seem acceptable, choosing an all-metal cage would be the best option. A cage’s design is not just a trivial factor as it defines the level of comfort your pets get from their shelter. It is imperative that your cage exhibits a solid flooring to hold paper or fleece bedding. This could be heavy-duty plastic or PVC covered metal. Wire grates may seem beneficial as it allows pet waste to just fall through and hence, your fancy rat doesn’t have to step on his own poop. However, wire floors increase the risk of your tiny fellow slipping his feet between the mesh flooring. Not only will this cause sprains but also serious damages to his tiny feet that may require amputation. Having his feet constantly pressed against wire causes a condition called bumblefoot, which is characterized by painful sores and swellings that could become infected. If you don’t want your pet hurting, then choose a cage with solid flooring. Moreover, take a closer look on its shelves and ramps. Both should be organized in a way where you can easily adjust them. Most importantly, make sure the ramps have a textured surface for traction so your pets won’t slip as they climb up. While you opt for a cage that provides you with an easy access to all its parts, make sure its door will also remain tightly shut and inaccessible when you mean to close it. A cage is completely useless if it can’t contain your pets. Rats are highly intelligent and hence, they can easily unfasten a feeble latch. If your pet rats can easily open the door, then the cage fails to serve its purpose. Apart from its latch, check the gap between its bars. In general, the gap depends on the size of your pet rats. If you wish to get a temporary housing for your baby rats, then choose a cage that has ¼” bar spacing. It doesn’t matter if the cage has vertical or horizontal features. On the other hand, the most secure cages for adult rats and large rat breeds, have ½” bar spacing. A good quality cage may often cost a pretty penny but this is quite inevitable if you want something that could endure the ravages of time. With proper management, a good quality cage can be used for many rat generations. If you were to choose a metal cage with plastic components such as shelves, ramps, or pans, make sure these items are made of heavy-duty plastic that won’t thin out or crack after countless scrubbing or bleaching. Likewise, make sure the metal is rust-resistant. You may opt for a metal cage treated with a sleek powder or PVC coat. Although these finishes are prone to cracking and lose their touch, still they make the cage last much longer. You’ll never know when you need to transfer your cage from one location to another. Therefore, your rat cage should have wheels so you can easily push it around your house. Also, assembling or dismantling the rat cage shouldn’t be that troublesome. What kind of cage is best for a rat? When housing your pet rats, a metal cage would be the best option. Not only will your whiskery friends enjoy climbing and peeping through the wires, metal cages provide maximum ventilation and are much easier to maintain. However, not all metal cages are created equal and hence, choose a metal cage that won’t bend and exhibits rust-resistant features. What kind of cage does a rat need? A rat needs a spacious, well-ventilated enclosure that can store basic items, toys, and other paraphernalia. The rat cage must be chew-proof and escape-proof. How big should a rat cage be? When it comes to purchasing a rat cage, a rule of thumb is to purchase one that is as big as your budget. Unless you have limited space or budget, then choose a cage that can provide at least 2 cubic feet of space for each pet rat. How to clean a rat cage? Move your pets to a temporary enclosure. You can either dismantle your cage or transfer it to a suitable area for washing. Immerse all rat toys and accessories in a tub of warm sudsy water for a few minutes before scrubbing. Scrub the rat cage using a non-abrasive sponge drenched in dishwashing liquid. Disinfect the entire rat cage using rat-friendly cleaning products or natural disinfectants found in your kitchen. Rinse the cage thoroughly using hot water. Allow your cage to dry. You may use a hair blower to dry your pet’s toys much faster. Once everything is dry, put them back together inside the cage. Don’t forget to add fresh bedding and new covers. How to disinfect a rat cage? As easy as spritzing apple cider vinegar can effectively disinfect any rat cage. Spray after every wash and wipe the cage daily with wet tissues drenched in vinegar. This is the safest and most economical way of keeping your pet’s cage fresh as well as minimizing the load of harmful microorganisms that could make your pet sick. A rat-friendly and veterinarian-approved disinfectant is also preferable. How often should you clean a rat cage? Moreover, you must thoroughly clean and disinfect your rat cage at least once every week without regard to the number of critters you have. How to keep a rat cage from smelling? Observe daily cleaning practices. Apple cider vinegar, which is a humble kitchen staple, can neutralize ammonia and serve as a natural deodorizer. Wipe the cage daily using wet tissues soaked in vinegar. In addition, make sure your pet rats are fed a proper diet consisting of high-quality lab blocks and a mix of fresh fruits and vegetables. A poor diet leads to oily skin and foul-smelling stools. Dispose visible waste and dampened beddings as soon as possible. Likewise, take away uneaten produce at the end of the day. How to make a rat cage smell better? There are many high-absorbent and odor-control rat beddings sold in the market today. The best rat beddings are recycled wood pulp. Unlike chip beddings, these beddings are dust-free and exhibit a paper-like absorbency. What to put in a rat cage? Before you take a rat home, make sure you have the following awaiting in his fur-ever home: warm beddings, a water bottle, a ceramic food bowl (filled alternately with dry rat food and fresh produce), a hammock, and lots of physically and mentally stimulating toys. What does a rat need in its cage? Apart from cool water and good quality food, rats need plenty of toys to par with their high energy levels. 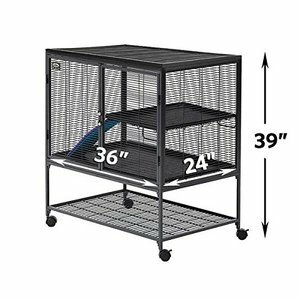 How to line a rat cage with fleece? Fleece may cost a pretty penny at the start; however, they are economical in the long run since you may simply wash and reuse them. Simply remove the pans and make a square or rectangular cut out for each one of them. Each fleece should be an inch bigger so you can tuck the excess under the shelf using a binder. How to get your rat to stay in its cage? Rats love to constantly move around, nibble, and play. As a result, it is crucial that you provide your pampered rat a large cage to accommodate various toys and accessories. If your tiny pet is living in the lap of luxury where he can enjoy doing various things and has an array of delicious treats nearby, he will love to spend more time in its cage rather than squeeze his way out of the cage. How to make a rat cage escape-proof? Choosing a cage designed particularly for rats is the best way to ensure it is escape-proof. If you have the misfortune of choosing the wrong cage, head to the home depot, buy a hardware cloth, and use it surround the cage. A rat cage should have ½” of bar spacing to be considered escape-proof. How much space does a rat need? A rat needs 2 cubic feet of space to be comfortable. 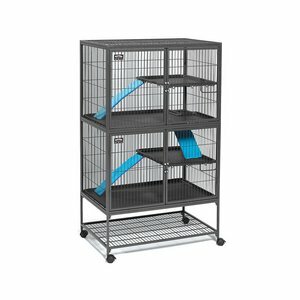 What cage size is suitable for 2 rats? For starters, a rat cage measuring 72 cm x 36 cm x 44 cm will suffice for two rats. Then again, you will be needing more space if you plan to add more toys and other items to keep them happily busy.